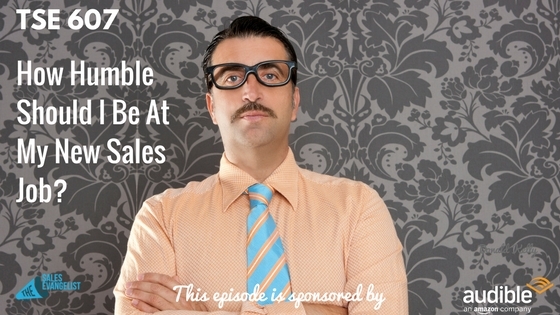 TSE 607: How Humble Should I Be At My New Sales Job? Home » TSE Podcast Post Page » TSE 607: How Humble Should I Be At My New Sales Job? Not having any luck with your hiring process? Today, I’m sharing my thoughts and insights into some hiring strategies that may help your business big time as well as what you can do as a sales rep to successfully get through the hiring process. Many entrepreneurs tend to scale really quick to get money into the back, to get the cash flow positive, and to have an opportunity to develop the company. However, one challenge they usually find is who should they go after – a brand new salesperson they can train and develop from the ground up or somebody who is more seasoned, has more experience, and more knowledge. I’ve talked with an entrepreneur who was left with this same challenge and what he did was he found someone who claimed to have a lot of experience in a similar field. This individual did amazing during the interview who was talking about numbers although he also noticed some red flags. You may be in sales for 20 years but with only one year of sales experience. This can be detrimental to your company since although the principles of selling are still the same, the way you execute sales evolves. Hence, you need to be able to learn and adapt to the changes. The individual being interviewed however did not show any learning mentality but showed some cockiness and feeling that he knows it all since he put all the numbers before. So this entrepreneur got him on board. As a result, this guy actually gave the business owner a heart attack and potential law suit because of what he said to the customer in the store. This basically raised another red flag but the entrepreneur was willing to put up with it as long as he can put some accounts down even just for the short term. Eight days later, they could no longer take the attitude of this individual and he got fired. This number two guy who applied to the company was much younger and more willing to learn. The problem was that the company wanted to get the quick win so they chose the number one over the number two. Upon firing number one guy, they reached out to number two and got him on board. Don’t sacrifice the integrity of your business for some short-term gain. The philosophy is you can train them and they can leave or you can not train them and they can stay. If somebody is not willing to be trained and to be taught in your process, you’re going to find some issues. Personally, I would go with the person who is less experienced but is humble and willing to learn. Look towards not just the quick win but at somebody who’s going to last on your team. But if you can get an experienced seller who is humble, willing to learn, and is a good team player, then by all means, hire that person. But don’t just drop an inexperienced person. Help develop them. When you go to an organization, be willing to be humble and understand the business first before spewing out everything you know. Be willing to understand their sales process and sales cycle and why they do certain things in a certain way. If you can develop a better way, have that shown through your results. Be humble and take in everything. Don’t be cocky and condescending. Learn what people are doing and why they do it that way. Practice it. Try your way and if your way can produce more, bring your insights to the organization. Want to improve your selling? Join the TSE Hustler’s League. This semester is focused on how you can help sellers to become more buyer-centric and increase their win rate of opportunities.